Note: I know that some people have problems with these plans, let me just say that up front. However, for many people who are under the supervision of a doctor they can be a viable alternative to things like weight loss surgery and it can be an option for those suffering from serious health issues with medical supervision. “In 2011, I went to the doctor because I was feeling just sick. Having had high blood pressure for many years, I just assumed that my pressure (as we say) was high. I had been hospitalized at least three times previously due to my hypertension. Of course, I have heard the stories and advice, like you need to eat less salty foods and exercise more. I usually would eat fast food everyday because I am not a cooker. I was drinking alcohol, not exercising and eating late at night. I always had an excuse not to go workout or do the right thing. I even hated walking to my mailbox. I am a natural people watcher. I look at a person’s style, fashion, and the way they move in their clothes. All the while I’m thinking, I wish I could look like that or feel as confident as they looked. The feeling of dread increased because I was turning the big 4-0 the next year. I was going to be 40 and fat. I weighed in at 226 lbs and was wearing 18-20 size clothes. I was also having problems sleeping, getting tired quickly,and just was not feeling as youthful as I wanted to feel. In my mind, I did not feel like I was 40. My body was telling me I was 40+. After a lot of encouragement and trips to the doctor, I decided enough was enough. I was introduced to homeopathic doctor by my co-worker. They have a masters degree in public health, is a holistic nutritionist and a health coach. The doctor suggested the HCG diet for me. 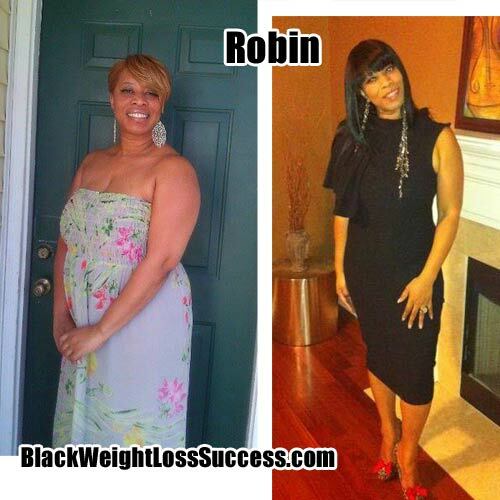 At first, I was really skeptically, she promised if I worked hard on the program I would see the results. I promised I would give it my best. The program required me to give myself a shot of the human chorionic gonadotropin (HCG) manufactured drug every day and eat no more the 500 calories a day. I thought to myself, nope I am not going to make it. To make a long story short, I lost a total of 14lbs in the first week. At the end of the 6-week program I had lost a total of 50lbs. I went from a size 18/20 to a 10/12. I was so happy but I didn’t realize how the weight lost would affect me. The good part was my confidence in wearing the clothes I so desired to look great in went up, I was less tired, less stressed, and was think about food in a healthier way. The bad part was without support, I was unsure if I was going to be able to maintain it. Robin, you give me hope. You are looking gorgeous and I thank God for your testimony! Robin, Good for you for taking control of your health and staving off potential deadly diseases. Kudos to you!! You look fantastic!! So enjoyed reading this. So much candor with encouraging attitude. Blessings!